in NOT IMPORTANT - Just make TIGHT stitches! 1 ¼” (3cm) in diameter - Can be made larger when using yarn instead of thread. 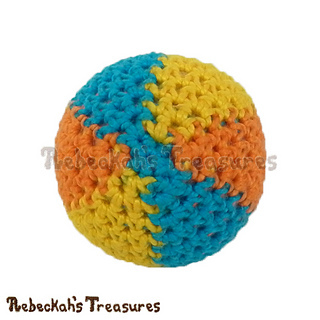 Add some fun in the sun to your fashion doll’s beach trip… Crochet this awesome beach ball! 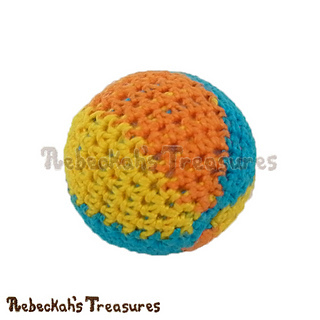 This amigurumi beach ball is worked using the ever-fun tapestry crochet method for switching colours. The Surfer Dude Fashion Doll eBook includes written instructions + photo tutorials for this Beach Ball. WIP photos show how to best switch and carry colours. 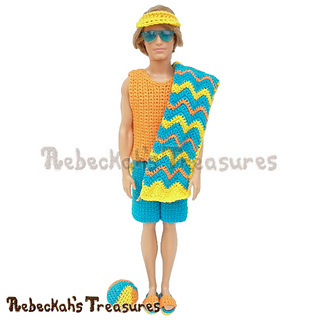 This eBook also includes FIVE additional patterns - Surfer Dude Doll’s Tank, Surfer Dude Doll’s Shorts, Surfer Dude Doll’s Visor, Surfer Dude Doll’s Flip-Flops and Fashion Doll’s Chevron Towel! Plus, now also available in Greybriar Hollow’s July 2017 Summer Issue featuring several other clever patterns! Grab it for only $7.00 USD. 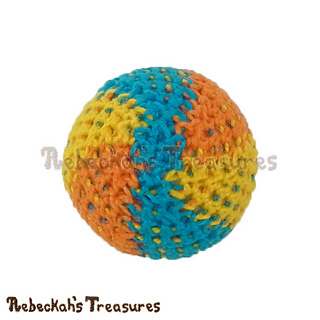 This beach ball is 1 ¼” (3 cm) in diameter, when using size 10 thread. The perfect size for fashion dolls! Adjust thread/yarn weight to make a bigger ball.